In considering how to get the ball rolling during a conference focused on supporting science inquiry using technology, this question came to mind: What is technology’s role in science education? To borrow from Holmes’ bit, use of technology in this way means “there’s no time for wonder or mystery…the time between knowing and not knowing is so brief that knowing feels exactly like not knowing.” I don’t know about you, but a sense of curiosity and wonder is pretty high on my list of science education’s most valuable outcomes, so I’m not too keen on letting it get trampled if I don’t have to. So I guess it stands to reason that my personal stance is to eschew technology’s role as “the sole provider of immediate answers.” If that’s not it, than what is? In order to answer this question fully, we have to start from the other end of the conversation. Instead of considering the tools, let’s consider the purpose: what do we believe about science education and what it should cause? There’s something about this definition that is so simple and yet so powerful that I refer back to it often when centering myself on what to look for in science education. Unpacking the definition, what does it say? Our students need to be active learners engaged in that process. Our students need to ask research questions. 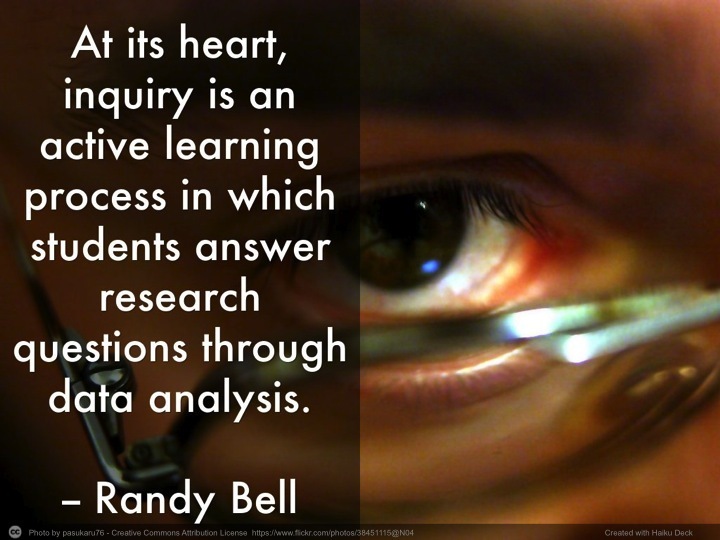 Our students need to answer research questions. Our students need to analyze data to answer those questions. So simple, and yet so many implications. Full disclosure: Randy Bell was my advisor while attending UVA’s Curry School of Education. There’s a story about Dr. Bell that years later I recognize as having a huge impact on me as an educator, and it also also seems to apply to this conversation about the role of technology in science education. While Dr. Bell had comprehensive experience in working in all of the sciences from an educational perspective, he tended toward a “critter-focused” lens when it came to his passions. He would always point out a variety of facets of life science around us, especially when it came to hawks. On each of the trips that our cohort group would take across the state for conferences and field studies, he would point out every one of the animals that was flying these central Virginia skies. “Look- a red-tailed hawk!” he would point and exclaim, as we chuckled and shrugged in reply. As I was a physics education major, “critters” were not exactly one of my passions, so it was only years later that I began to appreciate what I learned as a result of his interest. 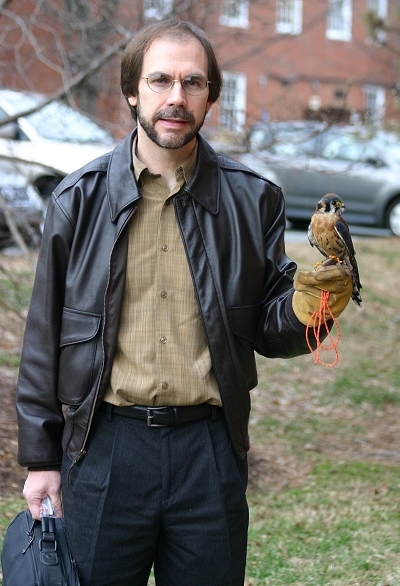 You see, Dr. Bell had a pet hawk, and I always thought that was pretty strange. I found out that Dr. Bell was a card-carrying falconer, which meant (or so I thought) that he kept hawks that he captured as “pets” at his house. While it helped me to understand his recognition of the red-tailed hawks as they soared above our heads, knowing this about Dr. Bell also made me think he was taking the whole “science guy” identity to an unnecessary new level. At its root, I guess I just thought that a hawk was one strange pet to keep. Upwards of a decade later, I got the chance to have a longer conversation with Dr. Bell about the concept of being a falconer. I found out that in his mind, the role wasn’t really about keeping the animal as a pet, nor was it just about having an interesting “science guy” hobby. Being a falconer for him was more about serving as a trusting partner with the hawks in order to meet their life needs and ultimately help them survive. Many falconers, he explained, capture younger birds of prey in the late summer / early fall who have not yet fully developed their hunting skills. During the colder winter months, the falconer keeps the bird safe from the elements, while also helping it develop these important life skills. When falconers take these birds out into the wild, they’re not just doing it to have a good time- they are bringing the birds out in order to rustle up prey that the bird can eat. Ultimately, it is a partnership between the young bird and the falconer. During trips into the wild, the falconer’s job is to find places where “food” for these birds might be living: small rodents, amphibians, insects, things like that. By rustling around in piles of leaves and brush, the falconer “flushes out the game” by moving some of the ground cover that might be obscuring these small animals. Once the would-be prey emerges from its hiding spot, the hawk spots it, catches it, and eats it. Over the course of their partnership, the falconer and falcon repeat these trips together, helping the bird develop both its strength and its hunting skills. As the bird builds its capacity for self-sufficiency, it then learns to live independent of the falconer, and eventually flies back out into the wild. Ultimately, without the falconer’s assistance, the hawk may not have survived the winter. In fact, research shows that up to 60% of juvenile raptors do not make it through their first winter. Once I finally understood the role of the falconer, Dr. Bell’s interest in the animal finally made sense to me. It wasn’t being a “science guy” that made him into a falconer- it was being an educator. This image of the falconer flushing out game for the hawk learning to fly reminds me of the role of the teacher in science education, with one key exception. It’s not game we as science educators are flushing out: it’s understanding. Our job is to try to identify what it is that obscures understanding for our learners. With our questions, we poke and prod at the barriers and obstacles that cover up students’ understanding until one of those questions is able to force the “would-be prey” out from its hiding place. Consequently, the developing learner can now see the understanding, which allows them to catch it and swallow it whole. Over the course of a relationship together with a trusted educator, the student starts to learn how to uncover that understanding for themselves. In their metaphorical spring, they fly away, now skilled enough and strong enough to hunt for understanding on their own. Now that I have recognized this approach to teaching and learning, I can’t help but see that it surrounds me. It’s central to the tutorial process within the AVID system for learning, within which I have found myself as a tutor trainer and district supporter. It’s central to the process of instructional coaching, within which I have found myself as a model designer and “coach of coaches”. And as it relates to this context, it’s central to inquiry-based learning in science instruction, within which I have found myself as a “lead learner” and district team facilitator. When I think about the metaphor through that lens, it looks to me as if Dr. Bell has been a falconer in many more ways than just that literal card-carrying sense. So how does this story help to answer the original question: What is technology’s role in science education? If science education is, at its heart, an active learning process where students answer research questions through data analysis, then technology needs to serve as a tool to help in all aspects of that process. Not just access to others’ discoveries, but also to tools that help us make new discoveries. Not just in the providence of answers, but also in development of wonder. Technology needs to help our students to ask better questions. Technology needs to help our students plan and conduct investigations. Technology needs to help our students evaluate and communicate information. And of course, technology needs to help our students construct explanations. To borrow the falconry metaphor, these tools need to help our students become better hunters, and not just do all of the hunting for them. Using the tools to circumvent the learning process means that those students may not be equipped to survive those metaphorical winter months on their own. This entry was posted in Educational Technology, Instructional Coaching, Learning, Science and tagged AVID, Educational technology, Instruction, instructional coaching, Learning, Science instruction, Teaching. Bookmark the permalink. This is such a FANTASTIC post. I love the video to set the scene and the storytelling analogy is moving, spot-on, wonderful. Thank you for this inspiring post! Thanks, Tricia! And also thank you for organizing and inspiring the #ngssblogs forums- that little “push” got me to finish this post that had been sitting on my “to-dos” for months.